Tick tock tick tick, the clock ticks. Time is running out. From seconds to minutes, from minutes to days, form days to weeks, from weeks to months and from months to years. The clock keeps ticking. It doesn't stop. It doesn't wait. It doesn't go back in turn. And yet there is so much I want to be do, there is so much I wish to happen. Have you put your best in something but the outcome is not rewarding or there is no outcome to even show for it? Have you done all things good but only bad things happen to you? Is your age making you sad because it makes it feel as though you haven't achieved anything? Are you been pressured to do something or make a decision because you feel as though time is running out? Do you feel as though the time is working against you? Time is everyone's best friend and also everyone's greatest enemy. The great thing about time is that it has a creator, who happens to be God Almighty. Now the only way not to be moved about time is to trust the creator of time. As long as what you plan on doing won't hurt anyone or it is coming from a place filled with clean hands and pure mind, the creator of time will make things work out in your favour. All you need to do is to trust Him. Relax. Be patient. Take your mind off what is giving you sleepless night. The way you trust God to wake you up every morning is the way you will trust Him to come through for you. He doesn't fail. He never fails. He always brings our heart desires to us. Sometimes, it might not be what we wanted but what we needed and it will so much better than what we have been desiring all these while. So trust God. Trust His timing. Trust His faithfulness while you remain faithful. There is one person that the clock never goes against and that is God. Now won't it be nice to hand all your worries to the creator of time and the One who controls time? 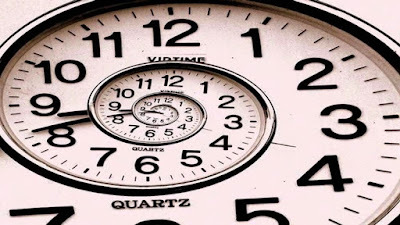 Let time tick, while the creator of time makes the ticking clock work to your advantage. Your only job is to trust Him and His timing.